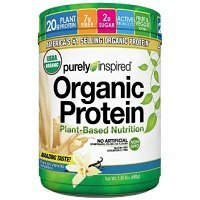 I ended up giving Purely Inspired Organic Protein 3.5 out of 5 stars. I think it’s a great, affordable option for a 100% vegan, plant-based protein powder. Usually these proteins are at a premium, but this one is just under 20 bucks for 19 servings. The macros are solid and you get 20 grams of protein, 2g fat, 9g carbs, and 130 calories per serving. It has 7 grams of fiber (which is a plus and helps curb hunger), so it brings the net carbs down to only 2g. That’s great since a lot of plant-based proteins have higher carb counts. This product is super clean and uses organic ingredients and no artificial sweeteners, colors, flavors, or GMOs. It’s incredibly allergy friendly and works perfect if you have any food allergies or are following a vegetarian or vegan diet. It’s gluten free, dairy free, and soy free. It has some additional blends in there, which I appreciate any added boosts in protein powders. This one has an organic fruit and veggies blend plus digestive enzymes and probiotics. It tastes great and is easy to use. I usually took it after workouts or in between meals to help squash any cravings. It really helps fill you up. I do wish it had some type of satisfaction guarantee, that’s a bummer that it doesn’t have one. On top of that it has a ridiculous return policy, so you’re basically SOL if you don’t like the product. Overall, I think it’s an above average plant-based protein shake and could work well for a lot of people. This protein powder is pretty easy to use. It mixes up a LOT easier than the majority of the vegan proteins I’ve tried. You’re going to mix 2 scoops of protein with 9 – 10 ounces of water or non-dairy beverage, like almond, rice, or coconut milk. It says you can stir vigorously to mix but the spoon method didn’t work very well for me. I used a shaker cup and blender and both mixed up well. I got Purely Inspired Organic Protein in the “French Vanilla” flavor. It also comes in “Decadent Chocolate” if that’s more of your style. This is definitely one of the better tasting vegan protein powders. If you’ve never tried a plant-based protein powder before, it’s definitely a lot different than your typical dairy-based protein powder. It’s a little thicker and a bit gritty and has an interesting aftertaste, almost like rice or oatmeal. Mixed with water, this shake still tastes great and when mixed with almond or coconut milk, it really amps up the taste. Let’s break down the macronutrients for this protein powder. Each serving size is 2 scoops (36g) and provides the following macros: 20 grams of protein, 2 grams of fat, and 9 grams of carbohydrates. There are a whopping 7 grams of fiber, so it brings the net carbs down to only 2g. 1 serving has 130 calories. I like these macros and they’re solid for a plant-based protein supplement. Purely Inspired Organic Protein is 100% plant-based and the protein sources come from an organic protein blend that includes organic pea protein and organic brown rice protein. These are high quality proteins and when combined they give you a full amino acid profile. This protein powder is a good source of amino acids like BCAAs leucine, isoleucine, and valine. These promote an increase in muscle development and increased endurance and strength. Pea protein in particular helps curb cravings and is very easy for the body to digest and absorb. This nutritional shake also offers some added health benefits. It has an organic fruit and veggie blend, which includes things like organic spinach, broccoli, blueberry, and alfalfa. It provides omega-3 fatty acids from flaxseed. The formula also has digestive enzymes and probiotics to help aid digestion and absorption. This protein powder is very clean and allergy friendly. It’s gluten free, soy free, non GMO, 100% vegan, dairy free, and cholesterol free. There are no artificial sweeteners, flavors, or colors, which is always a plus. I didn’t experience any negative side effects while taking this protein powder. I felt great the whole time I was taking it. This is a definite plus! One thing to keep in mind is that it does contain 7 grams of fiber, so make sure you’re getting plenty of water throughout the day. I did feel full after drinking this shake but a good full and not bloated or sluggish. So maybe take this protein powder after workouts or in between meals. This protein powder is pretty versatile. It’s best suited for vegans, vegetarians, or those with food allergies to soy, dairy, or gluten. It’s also a great option for anyone living an active, healthy lifestyle or wanting to tone up or lose weight. It has 20 grams of protein per serving and has some added nutritional factors to help boost overall health. Purely Inspired Organic Protein costs $19.99 for a 1.50-pound container. There are 19 servings per container and it ends up being 5.26 cents per gram of protein. That’s really affordable, especially for a plant-based protein powder! I’m happy to see a more reasonably priced plant-based protein shake. If you are not completely satisfied with your purchase, you may return or exchange the item in its original, unused condition (including all original packaging) within 30 days for a full refund, less shipping and handling charges. I’m not sure how they expect you to know if you’re satisfied or not if you can’t even try it first! 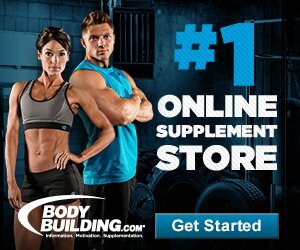 To buy Purely Inspired Organic Protein, click here.